If a customer comes to you with uneven brake wear and you just assume it is a bad caliper and replace it, you may be guessing. Imploded brake hoses and stuck proportioning valves produce hidden symptoms that are not easily diagnosed. Here is a very common scenario that shop owners face because of uneven brake wear: A customer comes in with the brake pads on one side worn down to the metal and the other side in good shape. The first reaction is to replace the calipers, rotors and brakes then test drive the car and return it to the customer. Two weeks later, the customer comes back and describes the same noise and problem as before. But this time, they’re not so nice! As soon as you pull the car into the shop and hear the metal scraping again, you will immediately know what the problem is, but may not know why it’s happening again. At this point, some techs will install a second set of parts hoping the first caliper was bad; maybe replace the proportioning valve, the master cylinder or the brake hose. Symptoms of an imploded brake hose occur when the inner nitrile tube of the brake hose ruptures. One reason for an implosion is the use of vice grips to crimp off a brake hose when changing calipers. It is a bad practice since many times it will break the inner nitrile tube setting the stage for a hose rupture and implosion. Another reason for a hose implosion is at the mechanical connection where the manufacturers clamp the brake hose to the fender wall. Over time, there is a chemical effect between the clamp and the hose causing the inner tube to harden and rupture again, setting the stage for an implosion of the inner tube. 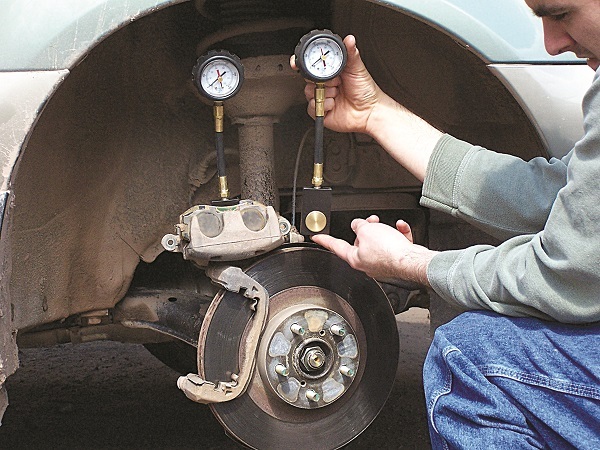 Once the tube rupture occurs and the brakes are applied, the master cylinder has enough pressure to push past the rupture actuating the brake caliper. However, when you release the brake, the implosion acts like a one-way valve, not allowing the fluid to find its way back to the master cylinder or the caliper to allow it to be released. This has all the indications of a stuck slide or frozen piston, but it is only the hose that needs replacement. It is a hard lesson to learn when the car comes back with the same symptoms after replacing all the brake hardware, i.e., rotor calipers and brakes. This article was brought to you by IPA Tools.